One day soon i will have a work space at home. This is very exciting. It will be in the building in the middle of the garden. It has needed a lot of work. In freak weather the space was flooded in the past so, although it is unlikely to happen again we decided to to protect it by raising the floor. My man has once again found hidden talents and a use for all his beloved tools. I am so impressed. He is not a tidy worker, but he is a really hard worker. Over the Easter weekend he was out in the snow working on this project. The room will be a place for me to work, a place for the girls to craft and paint and we are also hoping to fit in a tiny laundry area and space for food storage. So it really will have to work hard for us all. It is not huge but will be perfect for our needs. I am in the process of clutter clearing both at the Flour Loft studio and at home. The Flour Loft will close next week. Alice and i will continue to collaborate as 'Alice and Ginny'. Not a particularly inspiring name i know but ours nevertheless. We will be changing our website and Not on the High Street to reflect this. 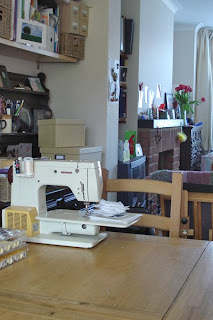 Until the space is ready I will be sewing from my dining room table. Not such a bad place to be as the room is nice and light. I would like to get back to posting about sewing soon. 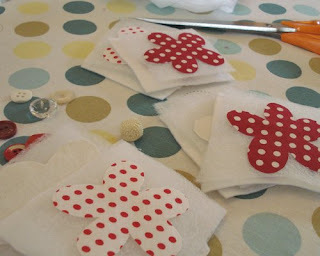 I am working on something for a special lady, who has been very patient for the wait. This sounds soexciting - a building in the middle of the garden to be creative in. Mind you it must be a wrench giving up your loft. And what a lovely dining room table it is. 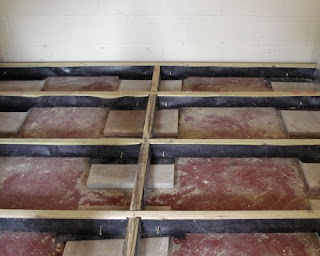 I like the name Alice and Ginny for your new business and the workshop will be great when it is up and running. To have a man with power tools! 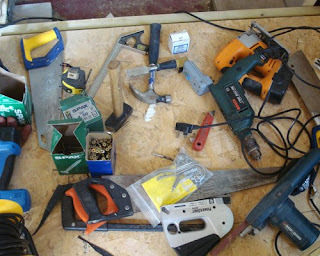 Your studio sounds exciting, isn't it great having handy men around! We're getting close to finishing the studio in the garden, I cannot tell you how excited I am about it! I've completely outgrown my little workroom and desperately need to get "out of the house", having somewhere to go and work will be so much better (I hope!) even if it is just across the driveway! Love Alice & Ginny, think it sounds great.